There is an ongoing battle between two brands that I noticed in my social media feed, specifically the brand sponsored posts. 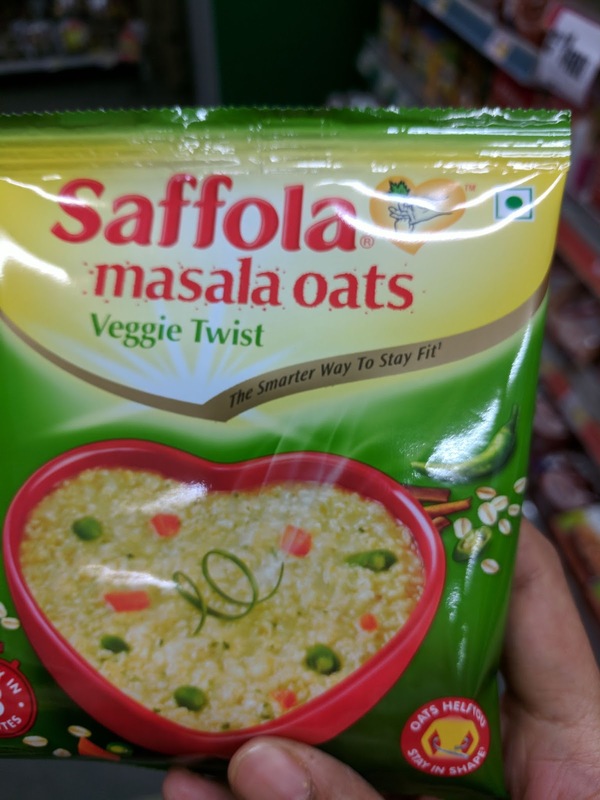 The two brands are Maggi Noodles and Saffola Masala Oats - the former being an established brand for the last 3 decades and the latter being a relatively new entrant trying to make a dent in the 3-minute instant cooking foods space. 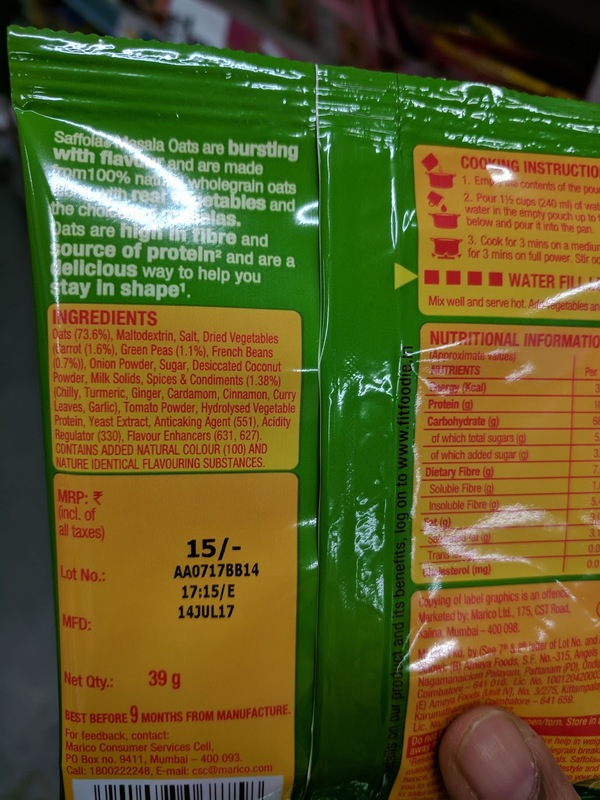 The latest promotions of Saffola masala oats point out that instant noodles are deep fried, but masala oats are 70% less in fats and high in fibre. Their positioning is focused on being a healthy product with tagline “Tasty way to stay fit”, “The smarter way to stay fit” etc. I used to be a big fan of Maggi noodles in my teens and early 20s but now I have completely stopped eating it. I buy the small pack occasionally for my daughter because she loves it and it is one of the very few junk foods that enter my pantry. 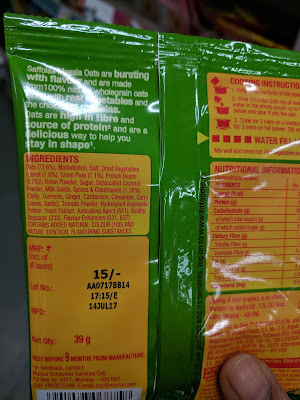 I have never tasted the masala oats pack from Saffola or from any other brand. 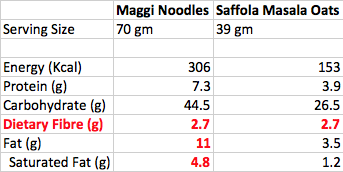 From the nutrition information, a single serving of Maggi has the SAME amount of fibre as that of Saffola Masala oats - a meagre 2.7 gm. A medium sized pear has 5.5 gm, a medium sized banana has 3.1 gm, 100 gm of guava contains 5.4 gm of fibre. Processed oats, especially the quick cooking ones that get ready in 2-3 minutes has very little fibre. So let’s not buy into such statements from these oats brands. There are so many good sources of fibre - grains, pulses, vegetables and fruits. If you are still adamant about eating oats for increasing your fibre intake, then opt for rolled oats. From the nutrition information, this claim seems to be true. The actual difference is around 68%. From the ingredients of “Saffola Masala Oats - Veggie Twist”, here’s the list of so-called vegetables. Look at how minuscule the percentages are! And most importantly, these are dried - which means they have absolutely no nutritional value. Again, a minuscule percentage (1.38%) of chilli, turmeric, ginger etc. Aggravates food intolerances. May cause asthmatic and allergic reactions. Not permitted in foods for infants and young children. What’s so “delicious" about these harmful flavour enhancers? Please don’t misinterpret that I’m supporting Maggi. I’ll write a separate post on it soon. We all know Maggi is unhealthy and the brand doesn’t seem to associate itself strongly with any health-focused tags yet. Exception being the recent “goodness of iron” or the other variants involving wholewheat and oats, that don’t seem to create any major impact among their target segment who buy Maggi solely for its taste and quick cooking. Brands that position themselves as “healthy” need to be questioned, especially the “oats” related ones. They can’t just claim “high fibre”, “high protein”, “smarter way to stay fit” etc. Let’s not blindly believe such messages and the attractive ads. Thanks for this information Dr. If we want to consume oats, in what form or kind are they most beneficial? Please suggest. @Karrtik, I'm not a doctor. I'm sharing my personal views on packaged foods through my blog. Rolled oats / steel cut oats (plain) are the better choices IF you need to consume oats. One can stay healthy even without eating oats.